Katniss Who? That’s what every new somewhat dystopian YA book with a heroine likes to say, “We’re going to make you forget Katniss.” The main character of Remy Alexander in The Sowing is not your typical stereotype. She is much different, and that’s only part of what is intriguing about the story. There are other concepts you can read on The Professional Project Site. They do a better job of explaining it than I could. I write about writing. You know, those who can do, those who can’t teach or write about it. Well I’m a former teacher who writes about writing. A blurb? Comparing Hunger Games and The Seeds Trilogy is like comparing a Jackson Pollock painting and a Van Gogh. Both are visually appealing and entertaining but one gives you something not quite as real as the other. The Professional Project Site: The Seeds Trilogy with the publication of the first book The Sowing: The Resistance Has Begun. 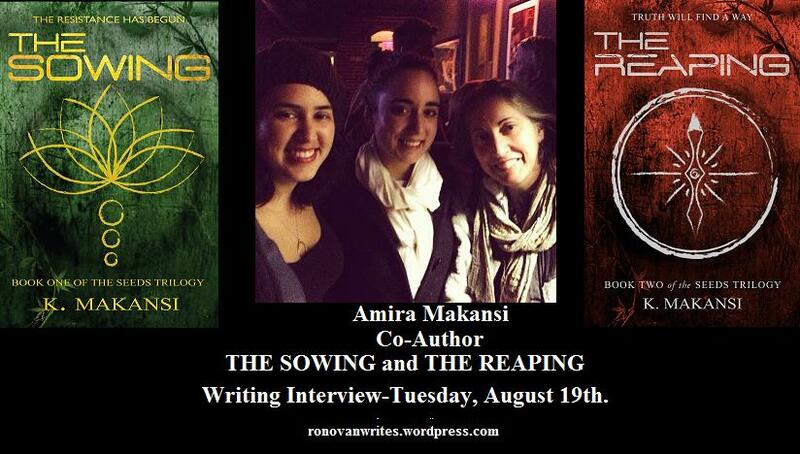 I recently spoke with Amira Makanski, the middle 1/3 of the Mother and Daughters creative team behind The Sowing: The Resistance Has Begun, Book One of the The Seeds Trilogy, and was much impressed with her passion for what she does and her being real. I could tell right away that her book is as half as full of spirit as she is then it will become a standard of measurement. She’s a very open and engaging person and the experience was entertaining, a pleasure and informative. I learned about her book The Sowing available to purchase in print and e-book. I won’t go into details about the book, I leave that to you to visit their the official site which does a great job of explaining the YA and NA mix of adventure/science fiction/romance and overall inner/outer life struggles/turmoil of its main characters. The site gives a great overview of the story, the background, and even has character profiles and discussions about the world’s technology and shows some of the artwork with the characters. I will say the world in some ways is almost a possibility which makes it even more of a must read. There are twists on characters that will appeal to you, I even identify heavily with one of them. No character is one dimensional it seems. In a way it keeps you wondering what the person might do next in a given situation. The heroine is not the typical cookie cutter versions of recent years and after reading the biographies of the authors you will understand why. The only thing I would change about this project would be to have my name on it instead of theirs. This was not an interview or review but simply someone impressed by a creator and creation and wishing to share it with other creators and potential readers. It’s out right now and the sequel is out this fall. Read it now so you aren’t behind. Visit the site. You’ll enjoy the tour and enjoy the author bios.